I went to a consignment sale with a friend last night. She consigns and volunteers so we get to go to the early preview shopping. The downside is everything is full price since the half price sale is at the end of the weekend. The upside is everything is there so it's not picked over yet and since the preview shopping is private it's really not crowded at all and you're able to actually look through the racks. I got some pretty good deals. 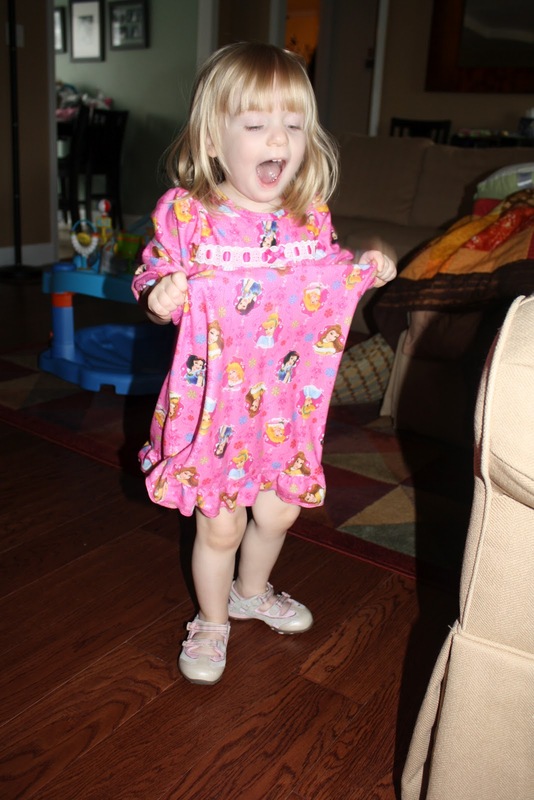 I went looking for summer tops and shorts for Sarah since she only has a few warm weather play clothes that her Aunt Elizabeth sent her. (Thanks Elizabeth!) And of course I had to get Sarah some shoes. I found 2 pairs of Stride Rite dress shoes for about $8 each. Stride Rite shoes are EXPENSIVE but they last and Sarah never complains when she wears them. She doesn't like certain brands, I guess they hurt her feet. Um, did I buy enough pink stuff? I'm not sure. I did splurge and get Sarah one smocked outfit. A cute Hula Girl top and capri set. It was $15 but it was in very excellent condition and normally stuff like that is easily $30-$35. For Cody I focused on getting him church clothes so there are a lot of nice button ups and collared polos. I even got him a pair of shoes that were brand new still with tags for only $4, a cute pair of dress shoes (see bottom left corner), and a pair of Stride Rite sneakers. I can't remember what size Sarah was wearing when she started walking so I guessed and got him a size 4. I also got him a lot of good deals on outfits, pants that came with one or two shirts for $4. Anyway, the real point of this post is not me trying to make myself feel better about how much money I spent last night on clothes the kids will outgrow with in a few months but the conversation I had with Sarah this morning. It went like this. Sarah came out trying to put her sneakers on. She loves shoes. Mommy: Sarah, I got you new shoes last night. Mommy: Yes, new shoes. Do you want to try them on? Sarah: Yes! Put shoes on! I get out her new pair of pink and gold strappy sneakers. Mommy: Here are your new shoes. Do you like them? Sarah: Are they squeeky shoes? Mommy: No, they don't squeek. Mommy: No, I'm sorry. But let's try them ok.
Mommy: Do you like your new shoes. Sarah: Yes! Look! New Shoes! Sarah showing off her new shoes. And I had my hands on a pair of squeeky shoes last night at the sale and put them back. I guess I should have gotten them. Cody Man! You are 6 months old! Half a year! Here's how you've grown. * About 2 weeks ago you got tired of hearing mommy complain about your lack of development. 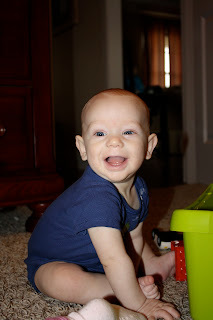 So you started babbling, scooting backwards, reaching and grabbing, and finally trying to sit up on your own. We are so proud of all that you've learned this month! * You love to play with blocks. You like how the bin is just the right height to hold onto while you work on sitting up. And the blocks make fun sounds when you dig around. They are nice and big and chunky so it is easy for you to work on grasping them. And they must taste delicious because you love to chew on them. * You still suffer from GERD. We had hopes that you would have grown out of it by now but you still need Prevacid to keep you happy. Last month we doubled your dose to 15 mg twice a day. At this check up your dr told us to back it down to 15 mg and to split the pill so you get 7.5 in the morning and the other half at night. We've been doing this for about 3 days now and it's hard to tell if this new dose is working or not. * You've started growing hair. It's a very light blond color and it's soft and thin but coming in nicely. 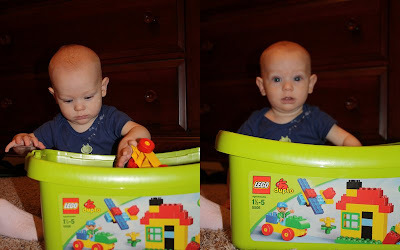 * You recently decided that your exersaucer and doorway jumper are fun. You'll play in those for extended periods of time as long as your best friend is near by to entertain you. * You are very curious and a busy boy. You jump when someone's holding you and want to grab and taste everything. Cody, you have an amazing personality at such a young age. Even though you still feel poorly often and we can tell you're throat and tummy must be hurting you, you are an extremely happy boy. You smile at everyone and everything. 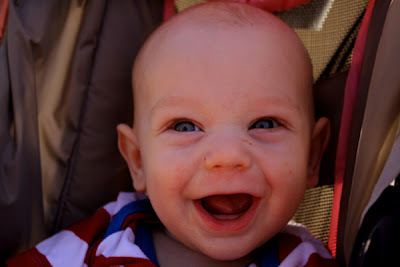 You giggle and coo and bring joy to all those around you. Your face lights up when anyone talks to you. You search in a room for the familiar voices of your father, me and your sister and then beam when you catch sight of us. You are very ticklish and squirm and giggle when anyone tickles you. You make everyone in this family a better person. You are your mommy's littlest sweetheart, your daddy's big boy, and you're sister's best friend. We each love you dearly! The St. Louis City Museum has got to be one of the coolest places we have ever been! It was so worth it and I can't wait until Sarah is a little older so she can enjoy it even more. We're already trying to talk the Boys into taking a big family trip so we can all go together and let the kids just go nuts. And I spent a ton of time snapping pictures and sending them to Annie to try to get a Combs/Schwartz trip together so Jessie and Sarah can run and climb and play together. There was just something so unique about that place. When the Joiners were describing it they said something about how you can be walking along see a hole in the wall and then it's a slide and your kid pops out 20 ft away from you. And they weren't kidding. Oh, don't mind this hole in the floor. It's just one of the many random entry ways into the caverns below. Take this little spot for example. 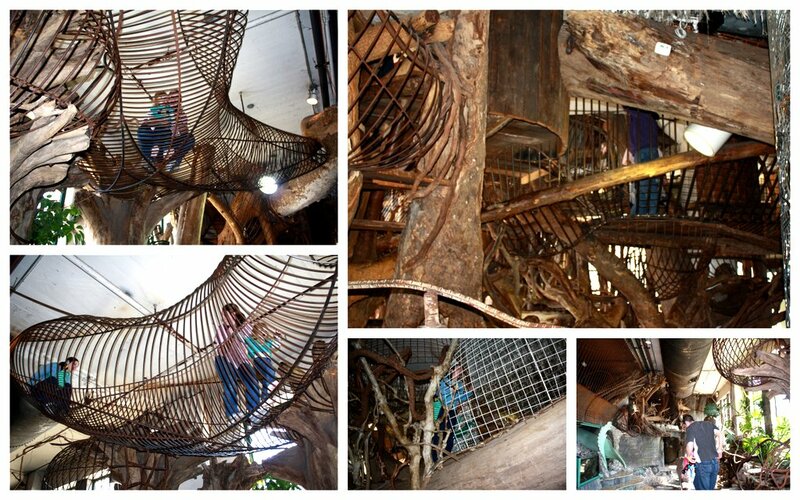 That big log is a slide that you can obviously slide down. Or you can climb on top of it (see the metal in front of it that makes part of the "cage" that goes around it). Or you can come up from underneath the elephant's trunk (see there's a boy about to pop out). After we were climbing around in there for a little bit Sarah and I somehow got separated from Cam and we came out from under the elephant and Cam ended up on top of the slide. I guess she zigged when we zagged. But it was just tons of fun! So when we got there as soon as it opened in the morning at 9am because I thought it was only open until noon (the website said 12, but didn't have am or pm, it was 12 as in midnight). And it was great because we were the only ones there really for about 30 or 40 min. We checked out the tree area and Sarah loved looking at the big tank that had lots of turtles and the biggest catfish I've ever seen! 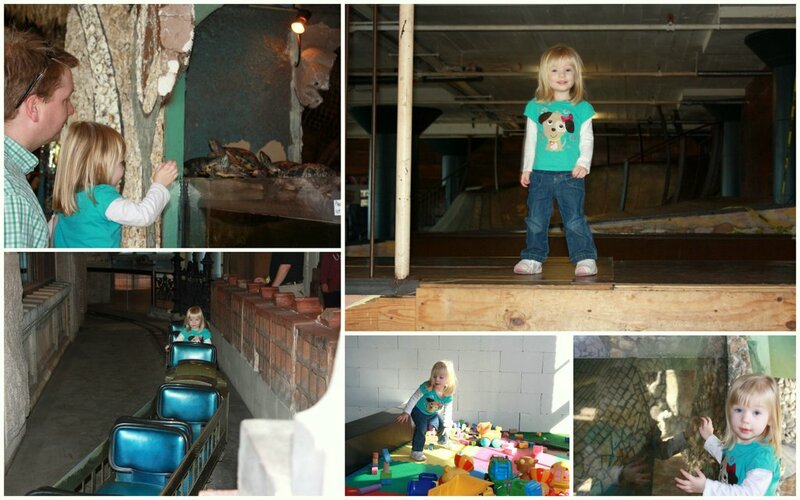 (Top left picture looking at turtles, bottom right corner in front of the tank). Here we are first thing as soon as we got there exploring the tree climbing area. So cool! A little hard to navigate some of the tighter places with Cody strapped to me in the Moby. I did conk his head a few times but he was such a good sport he didn't mind. I think he was loving all the new stuff to look at. Then we headed over to the circus area on our way to find toddler town. Action Chris here showing how the rope swing is done in the circus area. Sarah wanted a turn so I was letting her feel the rope. We eventually let her swing by having Chris hold her bottom as she wrapped her legs around the rope and he moved it back and forth for her. She loved it. So at first we didn't know what these big concrete pits were supposed to be until we saw some other kids slide down them. Then it made perfect sense. And they were fast slides too! I think I squealed a little when I went down because it surprised me how slick they were. After Cody woke up he and I found a cozy corner near the weird "mysterious mayhem" (I think is what is was called) exhibit with a comfy chair and not many people around so he could eat. Everyone who knows me knows I'm not a rock star. I'm not very comfortable with nursing in public so the fact that I didn't run out to the car to do it is pretty impressive. But that was one of the nice things about this museum it as so large and had some many cool things to do and lots of nice little quite areas also with comfy chairs to sit and handle that business. It also had a plethora of bathrooms nooked into all the areas so that was nice too. After Cody was done, Chris, Cam and Sarah came and found me and we headed over to one of the restaurants in the museum. It was downstairs so of course why take the stairs when you can take this awesome 2 story slide! Those bars on the side turned so Sarah stuck her feet out and scooted down the slide touching every single one. Silly girl. I'm a big cheap skate so I wasn't thrilled that we were going to have to eat there since I was sure the prices were going to be jacked up but they weren't. It was priced about like McCallister's or Newks and the food was really good. I had a turkey and bacon panini that was really yummy. If it wasn't for the fact I'm supposed to be not eating dairy we would have just bought one of their yummy pizzas and it easily would have fed all of us and they were only $16. After lunch it was Chris's turn to wear Cody in the daddy pack and my turn to climb around with Sarah. I LOVED IT! So much fun! At first Sarah was a little nervous because of the metal. It freaked her out to see the ground beneath her and made her unsure of her feet. So I had to awkwardly carry her in a few places. But after a little bit she got the hang of it and was scurrying around and I was having to work to keep up, especially when she went in small places and I had to army crawl to fit! Eventually we wound our way over to the caverns area and crawled around in those tunnels but it was too dark to take any good pictures. I had to use Chris's flashlight app on his cell phone to see down there. The cavern area also home to the 10 story curly slide. It's a single rider only no kids on laps so Chris was nice enough to take the kids down so Cam and I could go down the slide. We got done at the slide just in time to make it for the circus show they put on at 1. It was a cute show put on my some students of their circus school in town. But Sarah was winding down and getting ornery. So we had to skip playing in the cool outside area and save that for next time. Sarah and Cody both had to grab short naps on the way over to the temple. We wanted to pick up some stuff at the distribution center. Then being the best Mormons ever we went straight from the Temple to the Budweiser Factory. Ha! Ideally we would have gone to Grant's Farm but it's not open yet for the season and someone told me that part of the factory tour was to meet the Clydesdale Horses and see their stable and Sarah loves horses so we thought what the heck. I thought the whole tour smelled terrible. But I've never seen a factory before so that was pretty interesting. I guess our school never took us on any of those field trips. Next time we'll definitely wait until a little later in the year to go so that we can visit the horses at Grant's Farm instead of the factory. 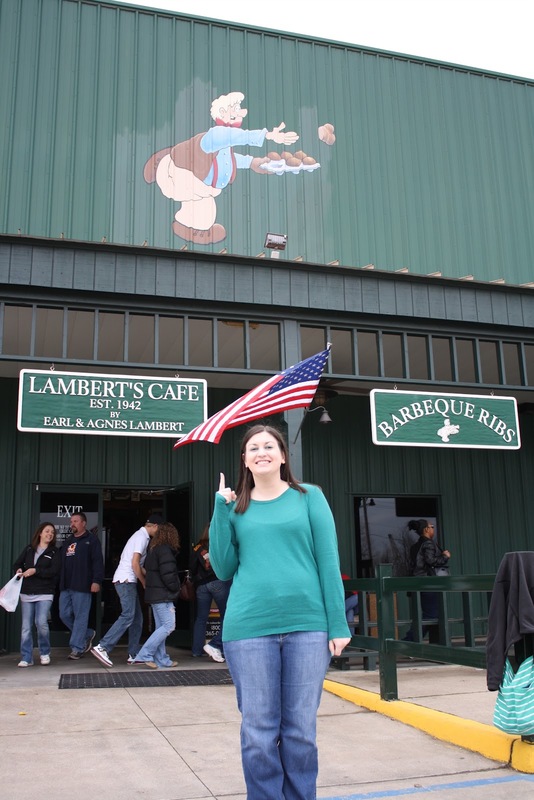 And what would a trip to St. Louis be without a stop at Lambert's in Sikeston? I LOVE THAT PLACE! 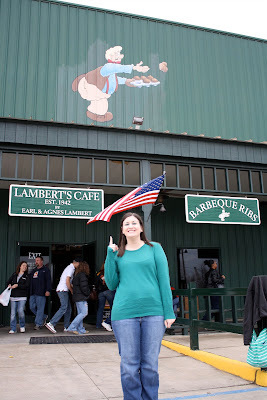 Seriously, one of the pulls for why I picked a trip to St. Louis was definitely the draw of getting to stop at Lamberts. There was a wait of course so we played out front for a while as we waited. Cam and I are in full geek mode about The Hunger Games coming out next week so she was excited about going to Lamberts so she could try to find her own Peeta. The portions are massive! The salad said it came in a bread bowl. Cam thought that meant a bowl they served bread in. She was a little surprised at this massive thing they brought her. To take the leftovers home they brought like a clear plastic trash bag to slip it in and tie it shut. A long, long time ago in the pre-kids day when I worked and we had expendable income and could do whatever we wanted with little foresight and planning (ah, the good ol' days) I invented a game that I liked to call The Priceline Game. Now to understand the game you have to understand a few important facts about priceline (and I'm talking the old days where all you had was the name your own price option). When booking on priceline using the name your own price you put in the city, you can pick areas of the town (i.e. downtown or the names of various suburbs and neighborhoods), the number of stars, and the price you want. Then Priceline goes out and sees if any hotels with those specifications will accept your price. If one does then they automatically charge your card and your room is booked and paid for. YOU DO NOT GET TO PICK THE HOTEL. They tell you where you're staying because that's the hotel that accepted your price. If no one accepts the price sometimes they tell you that if you change it to this price there is a hotel willing to take it or they just say sorry no can do. And then you can't put in that same bid for 24 or 48 hours I can't remember which. So here's how I play the priceline game. I'd get the sudden urge to want to go out of town. I'd typically call Chris and tell him I'm going to put in X number of dollars for a 4 star hotel in whatever city and if it gets picked up then we'd go on vacation for that weekend. If not, no skin off our noses the card isn't charged and it's not big deal. We've scored some pretty great deals for hotels in Atlanta, Chicago (my favorite trip), and St. Louis before. I usually put in for downtown hotels because I'm not familiar with the different neighborhoods and areas and pretty much figure the downtown hotels are going to be nice and close to the stuff that we want to go see and do. The downside is 4 star hotels don't have free breakfast like good old Holiday Inn and you have to pay for parking. Because of this I usually put in REALLY low prices to make myself feel better. Anyway, last Wednesday Sarah was being a pill and not taking a nap. I realized that it was Chris's spring break and we were SUPPOSED to be in FL at Disney World but had decided not to go visit my aunt and grandparents because Cody in a car for that long would turn me either homicidal or suicidal. And I was just about going nuts. Sometimes when I'm a little stressed out I do drastic things. Generally hair cuts or spending money is the end result of these moments of crazy. This time, I was sitting at the computer and turned to my old addiction...the Priceline Game. Some friends of ours had told us about the City Museum and I've been wanting to go since they mentioned it last summer. So I loaded up Priceline and typed in St. Louis, clicked on 3 star upscale and 4 star hotels in the downtown area and boldly typed in the price $45. (In a box on the corner it said the median price for these qualifications was $150.) I really didn't think much of it because I didn't think the price would get picked up. Then it did. And I had to call Chris and tell him what I did! We ended up staying at the Millennium Hotel in St. Louis. And the deal got even better. When we went to check in Chris was parking the car and Cami and I had the kids at the front desk. The wonderfully nice lady said they were out of doubles (even though I had called earlier in the day to ensure we had a double and a crib reserved). She then asked if Cam and I were "together". I'm pretty sure she was trying to ask if we were sharing a room but since only queen beds were available I said, "we are but not like that!" and she laughed and then told us since they were out of doubles what they could do was put us in side by side room and comp the second room. SCORE! So for those of you playing a long at home we just got 2 rooms for $45 or in other words $22.50 a room (before tax)! And that worked out perfectly because Sarah slept in Cam's room and Cody in our room. Then Cody cried the whole night both nights and I was REALLY glad we had separate rooms so that at least Sarah could get some sleep. We think the reason why Cody was having a hard time sleeping is because the rooms were so hot. They hadn't switched over to summer yet so the heat was still on and our thermostat wasn't working so there was no way to stop the hot air or get some cool air circulating. The second night when Cody woke up around 3:30 he was burning up and dehydrated. We stripped him down and I fed him and tried to calm him but he was too hot. So I called down to the front desk and they said they were out of fans which made me a little cranky and Cody was screaming bloody murder in the background. The manager on duty said he'd see what he could do and about 30 minutes later he was knocking on our door apologizing and holding a little desk fan he took out of someone's office. Very nice guy. Once we got the room cooled down Cody and the rest of us slept just fine. The manager also put a note in our file so when I went to check out the new manager on duty apologized again. He said he couldn't comp our room because it was a priceline deal, but he offered us free breakfast (we declined since the car was loaded and we were trying to leave) and instead gave us free parking for that day. Another $18 savings! So all in all I think it was a pretty good deal. We stayed in a nice hotel that great customer service and spent WAAAAY less than the $159 a night that they charge on their own website for that same room. Man, I love playing the Priceline Game! So, I know I've put up a few pictures on here before of the various cake balls I've made for different get togethers we've gone to. I really enjoy making them. It's something that is so simple that even I can do it and for some reason people are always very impressed by them. I really enjoy making them because it's something that Chris and I do together. I bake the cakes and ball them up and then when it's time to dip and decorate Chris and I do it together. 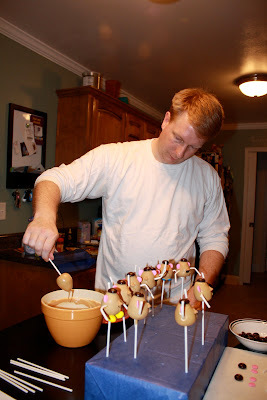 He always dips them, and then I sprinkle them before the candy coating or almond bark sets up. It's nice because we chat about whatever is going on, or about the event that we are taking them to. It's one of those things that with kids we don't really get to go out and do stuff together very often, so this is kind of a shared hobby that we both enjoy. Generally, when decorating I just toss some sprinkles on the top, or drizzle some of the candy coating over it. Then for the superbowl party I started to get a little more creative and we shaped them into ovals and I tried to pipe icing on to look like laces. So after doing that, I was really proud of myself! I'm not very creative but I just thought my little football cake balls were adorable! And it got me thinking about maybe trying something a little more ambitious. So I thought I'd make some cake pops for my nephew's 1st real birthday party. (He's a leap day baby.) My SIL said the theme was Mr. Potato Head and after a quick google search I found the instructions here from the amazing Bakerella. And Chris and I went to work. Are you ready to see what we came up with? Ta da! Oh my gosh I was so proud of these I was grinning from ear to ear! Aren't they amazing for a couple of amateurs? So even though the Bakerella has a far better tutorial here's a quick run down of how we did it and a few pictures I snapped of the process. Here's Chris candy coating the cake pops. You can see in the bottom right corner my work station. I had the stuff that had to be shoved on immediately laid out and ready to go for as soon as he put the pop in the block. The little army after the first step of the process. Before the candy coating set each man needed his hat, arms, ears and nose put on. Then after the candy coating set up we had to go back on and attach the details. Here's Chris showing me how to use the 2 toothpick trick to attach the little pieces like the eyes and the lips. The mustache an shoes were big enough that I could just hold on there with my fingers, but the eyes and lips were pretty tiny. And here's the final result and finished product. Aren't they just adorable! So here's the anatomy of our Potato Head since it's a little different from Bakerella's. He's a devils food cake dipped in Peanut butter flavored candy coating. He has a junior mint hat, jumbo confetti sprinkle ears, lollipop stick arms, and peanut M&M feet. His eyes are candy buttons. His nose is a butterscotch morsel. His mustache is the end of a black licorice rope. His lip is a little red jimmie sprinkle. And his eyebrows are drawn on with an edible pen. And he was worth it!